Anyone that’s been around me for any length of time in the past year or so has probably heard me rattle on about “Make“. Either the Blog, that I spend a great deal of time reading, the Magazine, the long anticipated Make:TV, or the Maker Faire that I had an incredible time at last year. Make is creativity, resourcefulness and the desire to create. 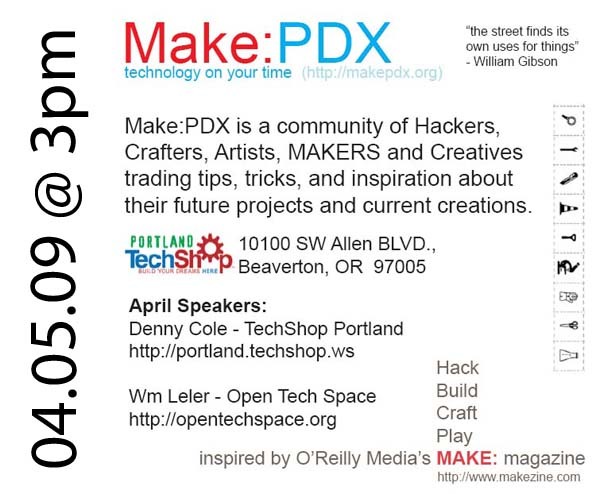 Make is DIY with a hacker ethos. As I have become a part of all this I am inspired daily by how people are rethinking, reimagining, and redesigning the world around them. In an effort to further this idea a few friends and I have been working together to launch a local Chapter of the Make: groups that have been popping up around the country. If there is one thing I have learned in this life, it is that the more skills you have and the more you understand, the more beautiful and full of possibility the world around you is.